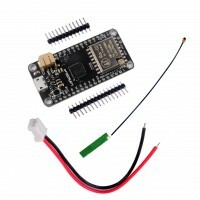 LoRa32u4 II is a light and low consumption board based on the Atmega32u4 and HPD13 868MHZ LoRA module and an USB battery charging circuit. Ideal for creating long range wireless networks that can exceed 2.4 GHz 802.15.4 and similar, it is more flexible than Bluetooth LE, does not require high power unlike WiFi and offers long range. HPD13 wireless module, using high-performance, highly integrated RF transceiver chip SX1276 design. Advanced LoRaTM spread spectrum communication technology to ensure that the module communication distance and anti-jamming capability greatly improved, and also achieved a very low current consumption. In the LoRaTM mode, the HPD13 provides higher reception sensitivity performance, more robust anti-jamming capability, and improved communication distance and reliability compared to the same transmit and receive modules on the market. In normal (G) FSK mode, it also provides industry-specific receiver sensitivity, as well as very high communication rates.